I finally got a moment to edit Jonathan Blow’s talk at the San Jose State Game Development Club earlier this year. Enjoy. Award winning game designer, Craft & Punishment Artist, and outspoken critic, Jonathan Blow speaking at San Jose State Game Development Club. Blow’s time bending, mind melting indi puzzle platformer, Braid, won the “Game Design” award at the Independent Games Festival in 2006. This episode of Off Book takes a very precise look at the movement of games in society right now. This very well produced video touches on many of the ideas we discussed as we put these shows together and not surprisingly features references to several games featured in Learn to Play and Craft & Punishment. Do “Art Games” Matter? from IndieCade 2011. Featuring Daniel Benmergui, Brenda Brathwaite, Rod Humble, Eddo Stern and moderated by John Sharp. Learn to Play exhibited Brenda Brathwaite’s Train and Rod Humble’s The Marriage and Learn to Play Too featured Brenda’s Síochán leat (The Irish Game). Eddo Stern is an old professor of mine so its pretty cool seeing them all together. In February we were blessed to have activist artist, Susana Ruiz of Take Action Games, come up from Southern California to visit the show. Besides giving artists talks at De Anza College and the Euphrat Museum we were also invited by the Silicon Valley De-Bug headquarters in San José. An exiting impromptu video interview was shot on the spot by Fernando Julian Perez . That interview is now live on De-Bug. Check it out. 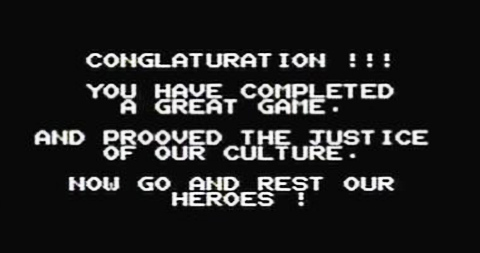 Super Brothers create game. Is amazing. 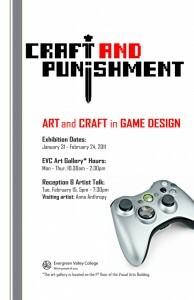 Award winning game designer, Craft & Punishment Artist, and outspoken critic, Jonathan Blow will be speaking at San Jose State University on Thursday April 21st. Blow’s time bending, mind melting indi puzzle platformer, Braid, won the “Game Design” award at the Independent Games Festival in 2006. From what I gather this will be more of an open conversation rather than formal presentation. 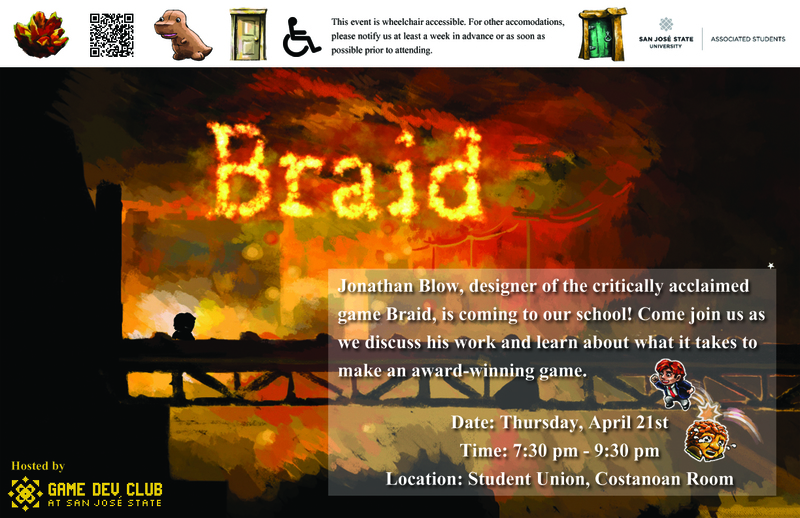 Whether you have played Braid or not, I can’t recommend this event enough. Much thanks to the San Jose State Game Development Club for making it happen. Lean to Play Too at the Euphrat Museum of Art and Craft & Punishment at Evergreen Valley College are closing their doors. February 24th will be your last chance to see these two glorious exhibits. A big thankyou to everyone who came out and to everyone who made these shows possible. This chapter or our saga has come to an end but who knows… Goonies never say “Die”! 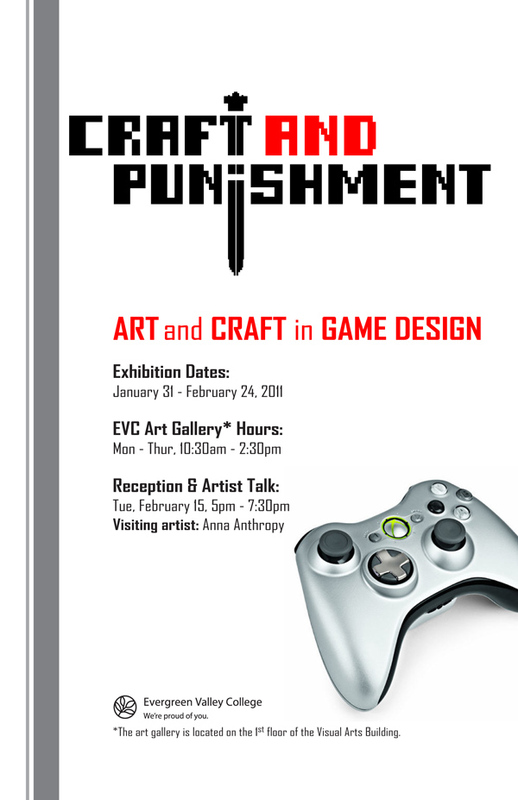 Craft & Punishment, a new show from the creators of Learn to Play, asks the questions: Is there a dialog between art and craft in game design? Where does such a distinction lead? Is digital pain the new pleasure? 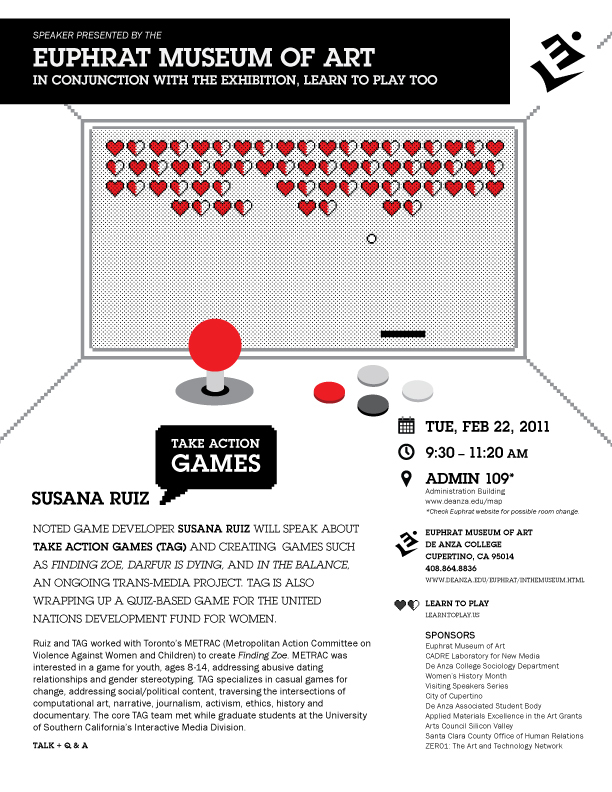 Noted game developer Susana Ruiz and Take Action Games (TAG) create games as Finding Zoe, Darfur is Dying, and In the Balance, an ongoing trans-media project. TAG is also wrapping up a quiz-based game for the United Nations Development Fund for Women. Ruiz and TAG worked with Toronto’s METRAC (Metropolitan Action Committee on Violence Against Women and Children) to create Finding Zoe. 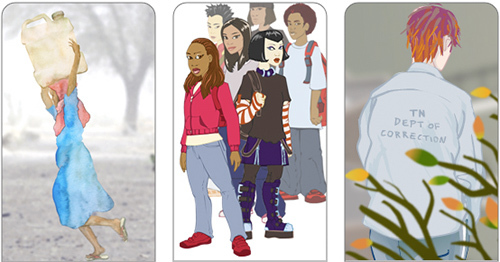 METRAC was interested in a game for youth, ages 8-14, addressing abusive dating relationships and gender stereotyping. TAG specializes in casual games for change, addressing social/political content, traversing the intersections of computational art, narrative, journalism, activism, ethics, history and documentary. Questions and discussion to follow. La Voz Weekly: What is art and play?